These stalactites (growing down from the ceiling) and stalagmites (growing up from the floor) have formed in Maori Leap Cave, Kaikōura. The cave was discovered in 1958, when it was unearthed at a limestone quarry. It is unusual in that it was formed by the action of the sea. 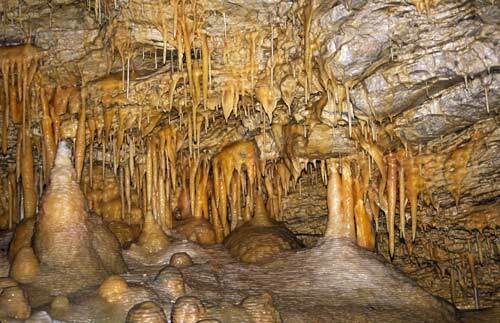 The land was then uplifted and over time stalactites and stalagmites were deposited in the cavern by seeping water.